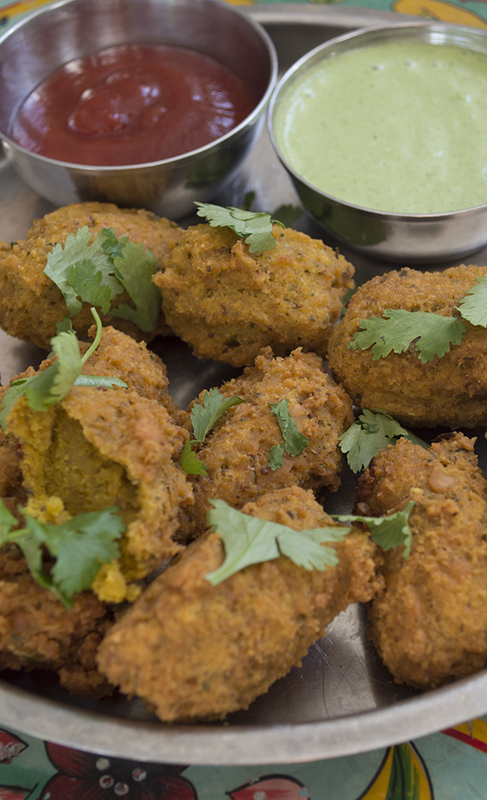 Arushi Patel, home cook and co-founder of Vela, has shared her childhood memories of dal - "dal - it’s comfort, it’s full of love, it’s Mum" - and this simple recipe for tasty dal bhajiyas, delicious tasty snacks eaten wrapped in chapattis or alone with ketchup and chutneys. Drain the soaked toor dal and place in a blender with the curry leaves, salt and chopped green chillies, then grind into a smooth paste. Place into a bowl and add the rest of the ingredients. Heat enough oil in a pan for deep frying and keep on a low to medium heat. Add a drop of the mix into the oil to check that it sizzles, remove this and add balls of the mixture into the oil. Fry for a good few minutes till golden brown. Use a slotted spoon to take out the bhajiyas and place on a dish with kitchen towel to soak up the oil. Serve hot with fresh coriander on top and ketchup / coriander chutney. Note: These bhajiyas go nice and crispy on the outside but you can also add chopped onions into the mixture for more texture. They also well in a flat bread with salad and chutneys - oh the joys of bhajiya! This recipe was shared by Arushi Patel as part of her childhood memory of dal.